Does purple really have more fun? We say “”yes!”” This deep purple colored basil (also called Opal Basil) is perfect in pesto, tossed in a salad, or preserved in oils and vinegars. Sold at the peak of freshness. 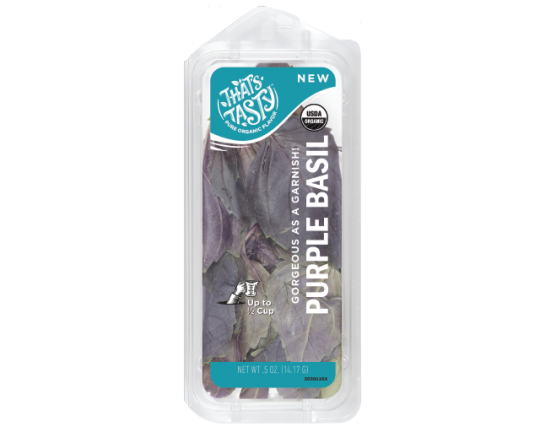 Our Purple Basil is grown and sold to be used right away for the best flavor. Forget diamonds, this girl likes opals! Have extra purple basil? No problem. Try these fresh ideas for how to use it quickly. Whip up a purple basil lemonade. Just add 1/4 ounce of packed purple basil leaves to any lemonade. Add a spring on top for garnish.